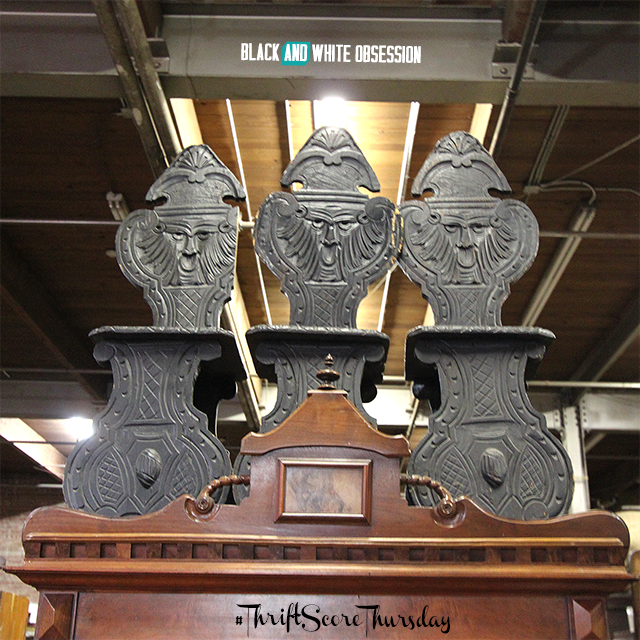 Yeah yeah yeah, it’s another beautiful Thursday which means it’s time for #thriftscorethursday. In case you missed it, yesterday I spilled all the deets about my trip to Salt Lake City for the Snap! Conference to which I shared a quite few Thrifted Goodies. While I was there I had the honor of joining 60-ish other bloggers in a Thrift Store tour of Salt Lake City. 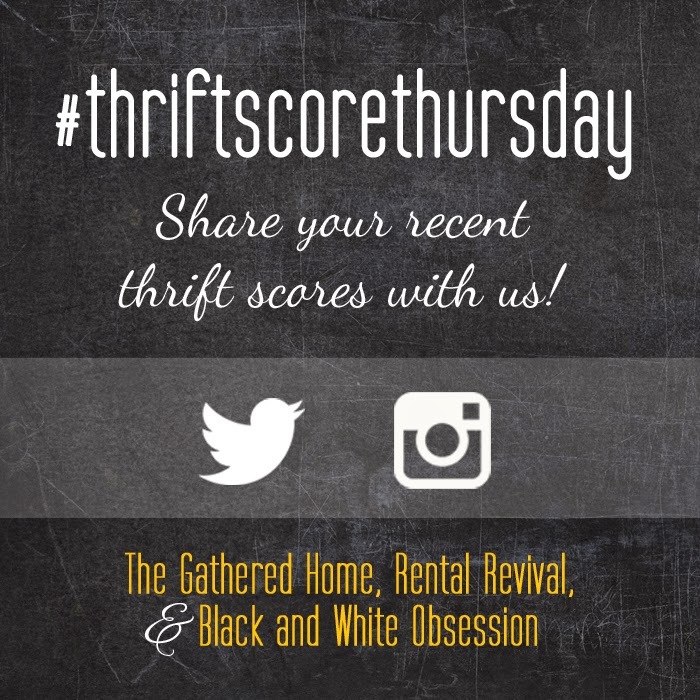 This week Brynne from The Gathered Home are showing off our thrifted goods and hope you’ll join us by snapping a photo of your thrifted goods and then using the #thriftscorethursday on Instagram or #thriftscorethursday on Twitter. If we fall for your treasures, we may feature them right back here next Thursday! Heart the photo or give her a follow here. Debra from Eve Isle Studios shows off this gorgeous set of Vintage Dress forms. I’m especially in love with the length of these beauts. The printing and ‘character’ equally add to the charm. I’d totally rock those in a walk-in closet... ahhh someday! 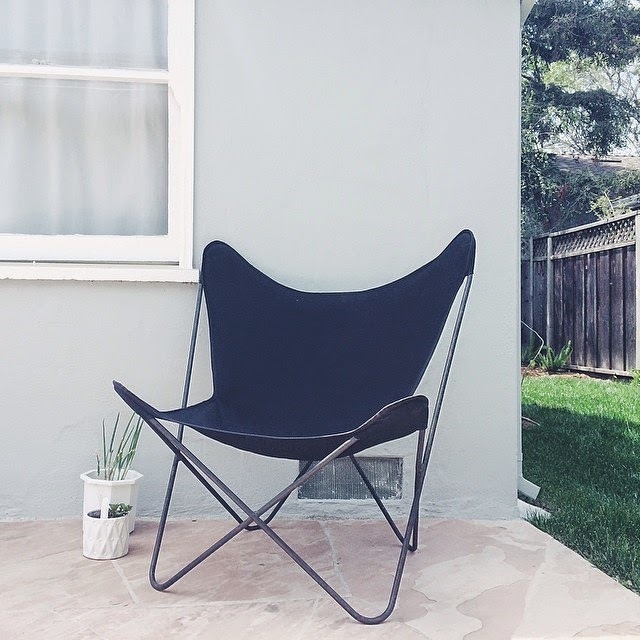 Sabrina from Retro Furniture shows off this Mid-Century Modern Butterfly Chair. Perfect lounger for this summer with those sleek lines and black is so classic it would fit right in with any other outdoor furniture! Especially loving that geometric planter off to the left side. 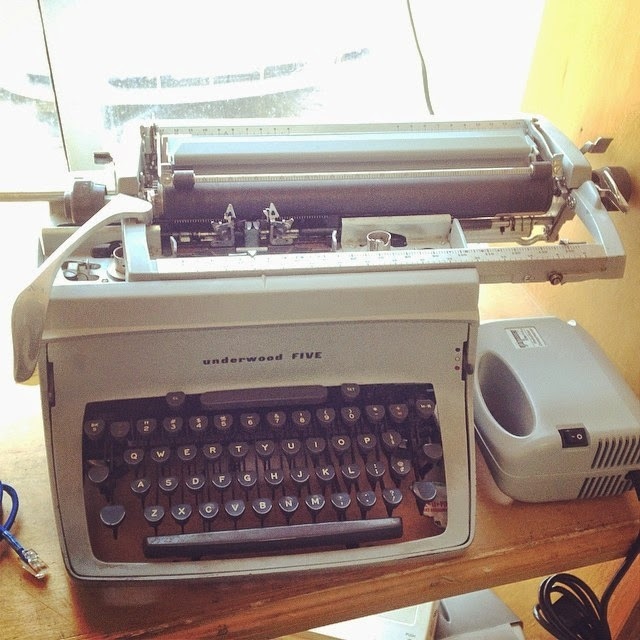 And of course I’ve fallen for my co-host, Brynne’s, Beautiful Vintage Typewriter find. Sadly hers was even a bit more costly than the ones I’ve come across at $65 I would have had to take a pass too. By far this was my favorite piece all day from Euro Treasures. I call it an “Elephant Foot Ottoman” and would have used/decorated as such. Oh how I had wished I had the room in my luggage for it!! Could you see me dragging that thing across the airport?! My apologies for the blurry-ness it happen to reside in a dark section. The beau and I have always wanted to either purchase an old Antique English Telephone Booth or build one and convert it into a media cabinet sort of like this. 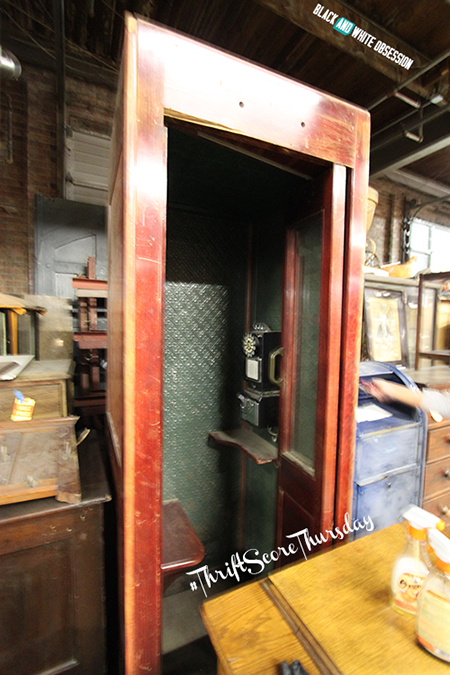 After spotting the Vintage Phone booth, I knew we could have made it fit. Rats that it was in a faraway city. Which would be super adorable filled with flowers as a garden centerpiece. I’m sure crafty moms out there could also convert it into something educational & fun for their kids as well. Then there was this set of Antique Aztec-ish three chairs. I’m really digging the carvings and markings. Such a statement piece they would be in just about any home. I know if I woke up in the middle of the night to this Antique Medusa Head shadow on the wall I’d probably have a heart attack. Either way it’s pretty interesting yet borderline creepy. If you’re hungry for more Instagram surfing use #thriftstorepartybus hash to see all interesting treasures we scored/spotted! It was a sad day when Allison from twothirtyfivedesigns‘s yellow letters she scored on the bus tour didn’t make the trip home. Have you ever thrifted while away from home? Did you notice any stark differences? Maybe the price/quality/variety differences? >>>Looking for even more amazing thrift scores? Pop by Brynne to see what they found this week (by clicking the images below). Those finds are fan-freaking-tastic! 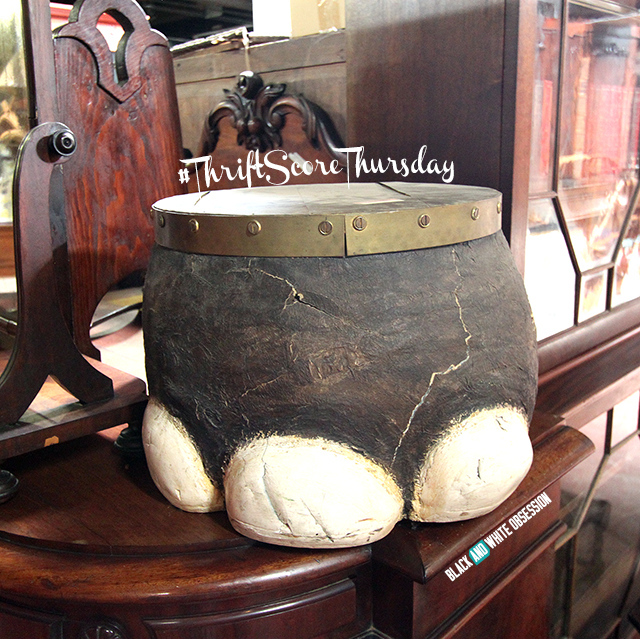 I've gotta say, I love that weird crazy cool elephant foot stool (hehe, oh I get it - a "foot stool"). So jealous of your awesome thrifting trip! It must have been s hard to leave some of those finds behind! Ive found a new love for the butterfly chair and this one sure does make my heart pitter patter! That head is so creepy - they seem to be the things I stumble across rather than treasures like those mannequins. I'm so with you on having them in a walk in closet!